Solar System: Jupiter. Creation Testifies! The fifth planet away from the Sun, Jupiter is composed primarily of hydrogen and helium. These are the same gases that comprise the Sun. Jupiter does not possess a solid surface but is an enormous spheroid of gas - eleven times the diameter of Earth - held together by its own gravity. The gas pressure increases with depth, eventually becoming liquid. The much cooler temperature of Jupiter allows the formation of molecules such as ammonia, water, and methane from various trace elements. These molecular compounds create Jupiter's colorful cloud formations. 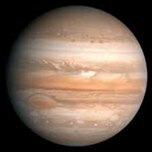 Jupiter is massive, the equivalent of 318 Earths! If we could put it on a scale, it would weigh more than twice as much as all the other planets combined! Jupiter is so massive that its gravity slightly, but noticeably, affects the motions of the other planets. Jupiter is 500 million miles away from Earth. Several of Jupiter's properties are consistent with its biblical age of about 6,000 years. These properties are difficult to explain via frameworks that adhere to a multi-billion-year-old solar system. Jupiter has a strong magnetic field. Since magnetic fields naturally decay with time, it is hard to understand how Jupiter could maintain such a powerful field over billions of years. Another indication of youth is Jupiter's internal heat. Jupiter emits nearly twice the amount of energy that it receives from the sun. Like popcorn fresh out of the microwave, planets gradually cool as they radiate heat into space. Jupiter is large enough to do this for thousands of years. But if it were really billions of years old, why hasn't it cooled off by now? The Great Red Spot, a large somewhat permanent feature just below Jupiter's Southern Equatorial Belt, is of particular interest. The Red Spot is a storm vortex, essentially a hurricane, roughly twice the width of Earth. At least 349 years old, this magnificent storm was first discovered by Robert Hooke in 1664. Before this time, telescopes were not optically sufficient to discern such features. So the Red Spot may actually be much older. Jupiter rotates in less than 10 hours. This is faster than any other planet. Such rapid rotation means that if you view Jupiter twice in one evening separated by a couple of hours, you will get a different view on the second pass since Jupiter will have undergone one fifth of its rotation. In order of increasing orbital distance from Jupiter, the Galilean satellites are named Io, Europa, Ganymede, and Callisto. In honor of their discoverer, Galileo, these four moons are now called the Galilean satellites. Unlike gaseous Jupiter, these moons are solid bodies composed of rock and ice. Jupiter and its moons are like a miniature solar system with the inner moons orbiting faster than the others. The Galilean moons are comparable in size to Earth's Moon. Io is 2,264 miles in diameter, only five percent larger than the Moon. Europa is 10 percent smaller than our Moon, and Callisto is 39 percent larger. Ganymede is the largest moon in the solar system at 50 percent larger than Earth's Moon. Ganymede is even larger than the planet Mercury! So, if this moon orbited the sun directly instead of Jupiter, it would certainly be classified as a planet. Due to its larger surface area, Ganymede appears noticeably brighter than Io and Europa and slightly brighter than Callisto. The planet Jupiter is a wonderful example of the Lord's creativity!